Happy Friday! I'm so happy the weekend is here. The re-entry week after vacation is ROUGH. Trying to get back into a routine after two weeks of relaxation (aka - not working out) and fun is not easy but completely worth it. I'm so happy the weekend has arrived and it's my birthday. I've always enjoyed celebrating my birthday but I'm not going to lie; turning another year older stings. I certainly don't "bounce back" like I used to and I have to work really hard to stay strong and healthy. My hope for this birthday and this coming year is health and more wonderful memories with family and friends. Now, on to a recent outfit and a favorite song on repeat. This was an outfit I wore out to dinner on our vacation. 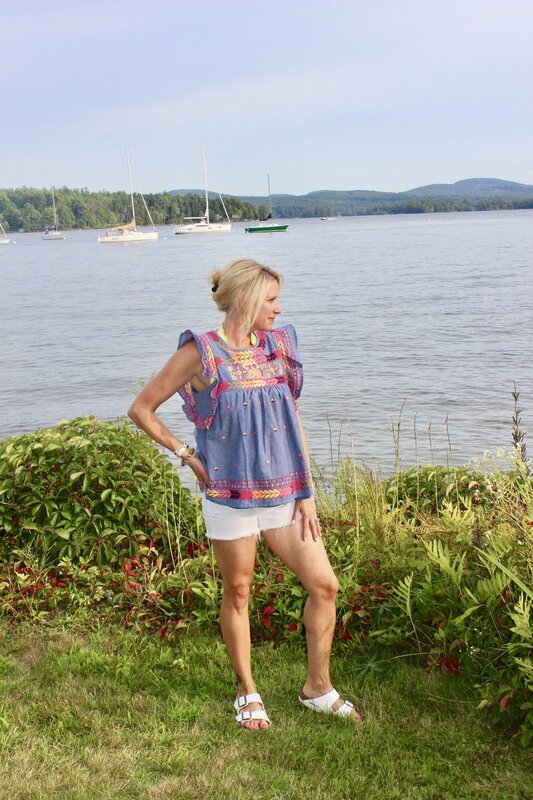 Since the lake is casual I wore my white denim shorts but had to don this embroidered top because I love it! The pop of color with my bralette makes it fun and the Birkenstocks, well, keep it low key. Backdrop of Lake Winni doesn't hurt either. Don't mind my #lakehair. Shawn Mendes has been all over the place lately (played in Boston on Wednesday night too...did anyone attend?). I never realized how young he is (19)...yikes! Although it isn't new, this song has been on repeat all week...the lyrics and his voice - love.